The Mets savored a win last night, in a game that appeared was going to be a brutal loss to the Miami Marlins. After blowing their one run lead in the 8th inning, an unlikely hero in Omar Quintanilla came to the rescue in the bottom of the 9th. After Lucas Duda reached second base, Quintanilla stepped to the plate against closer Steve Chisek. Quintanilla took on the other way for a double to tie the game back up. But Curtis Granderson made sure this game didn’t see extra innings. Granderson put one through the hole between the first and second basement to drive in the winning run. 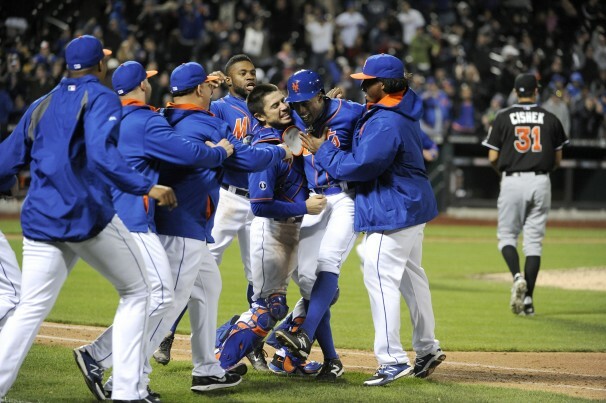 No one, and I mean NO ONE, needed that hit more than Granderson last night. With the sluggish start he has gotten off too, he has already begun to hear boos at Citi field. The Mets have been winning games early on while receiving very little offense, especially from Granderson. If the bats are able to catch up to the pitching, we could be looking at a much different Mets team this season. These are the type of wins that give you most satisfaction. Bad teams, like the Mets of recent years, simply quit and don’t fight back after blowing a late lead. Good teams, find a way to scratch their way back into a ball game and find a way to win. Could this be a sign of things to come? Too early to tell, but one can hope. Remember When People Were Worried About Derek Jeter?